On Sunday, April 28, 2019 from 5-7 PM, join fellow Forest Hills residents for the Annual Wine and Cheese Party. The party will be hosted at the home of Macon and Jay Richardson, 1318 Westminster Drive. This is a fantastic opportunity to get together with your adult neighbors and make new friends. Interested in helping with the event? Please email Lisa Merritt. 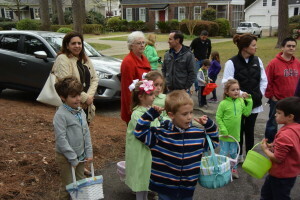 Bring your Children and Grandchildren, and don’t forget your baskets! Election day is quickly approaching! Turnout this year in absentee/ early voting is nearly twice as high as it was in the last mid-term election, so consider getting to the polls early. Voting occurs from 7 a.m. to 7 p.m. at Melrose Park. Gonzales demolition and rebuild on go! The long-awaited time is here. Gonzales Gardens officially begins demolition in October with planned completion by the end of the current year. The Columbia Housing Authority has provided new information on final plans for the future use. We have a neighborhood representative who attends meetings on behalf of Forest Hills and all updates are delivered in newsletters and posted on the website. Stay tuned for details.